VENTURE PUBLISHING - textbooks, videos and software for the math professional with special emphasis on AP preparation materials and graphing calculator books. Explorations in Calculus has been written as an enrichment to an AP Calculus course. Graphs are a very important component of calculus and are crucial in helping students visualize and gain insight in traditional calculus topics. Calculations can reduce time spent on " paper and pencil ". do a problem numerically and/or graphically because paper and pencil methods are impractical (too time consuming) or impossible. Each of the seventeen explorations starts with a set of Solved Problems followed by a set of Exercises. The solved problems are examples that provide a context for instructions that one might encounter in the exercises, but they also contain useful mathematical hints and lesson as well. The explorations in this book are not designed to teach you how to use your calculator. 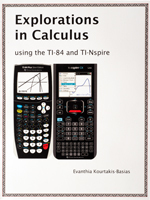 However, when an exploration requires you to perform a complicated calculator operation, you will be referred to the APPENDIX, where the specific key strokes are described in detail for the TI-84 in APPENDIX and for the TI-Nspire in APPENDIX B.
Click here to go to complete book list.